Last week marked the 40th anniversary of the Roe v. Wade decision in the U.S. Supreme Court, which declared laws prohibiting abortion violated a woman’s constitutional rights. The Supreme Court justices also ruled that states could regulate abortion in the interests of women’s health or to protect a “potential human life” starting at the end of the pregnancy’s first trimester. Seven out of 10 people in the United States support a woman’s right to an abortion. However, right-wing and liberal opponents of this right have used the states’ ability to regulate abortions to eat away at abortion rights over the last four decades. 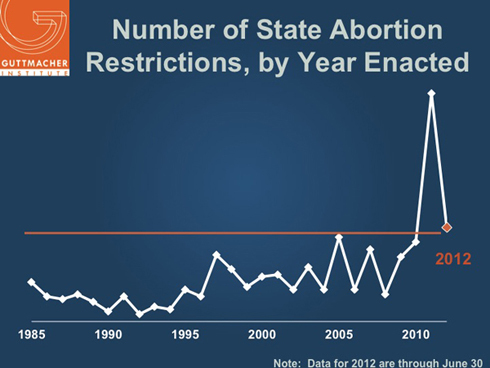 According to the Guttmacher Institute, states enacted more than 43 new restrictions on access to abortion in 2012. These restrictions came on top of the previous year’s record-high 92 restrictions. 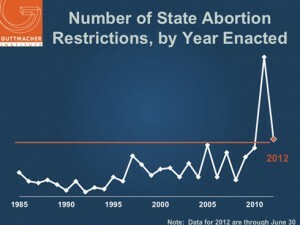 Legal challenges, alone, will not keep abortion safe and legal. Supporters of women’s rights need to mobilize to defend women’s constitutional rights and reproductive health.